Do you suffer from itchy, red skin that blisters and cracks? You most likely have a common skin disorder called eczema. Most people who suffer from this disorder try treating it with topical creams and lotions—and they offer little-to-no relief. So, what’s the better solution? Well, I’m going to share with you the natural technique that worked for me. But first, let’s talk about what prompts eczema. While the exact cause of eczema is unknown, it is believed to occur due to a combination of factors. Some doctors agree that a major factor is your genetics, so there is a possibility that you inherited it from one or both of your parents. Environmental factors such as allergens, chemicals, hot or cold temperatures, and stress are all known to trigger symptoms, too. Unfortunately, I know all too well the toll that eczema can take on your everyday life. Last winter, the small patches on my hands started getting worse. Day after day, it slowly started spreading all over my body. And before long, I was a red, itchy mess. The itching was so bad that it would wake me up at night. The red, burning patches on my face were the worst. I tried everything to get rid of them! My doctor prescribed me topical steroid creams. And when that didn’t work, she wanted to put me on a prescription of oral steroids. There was no way that I was going to take prescription drugs. So, I went on a mission to heal my eczema naturally, without taking pills. The first place I looked was to my food. Since I had been hearing a lot about food allergies, I went to a naturopath and had some food allergy tests done. The results came back, and showed that many of the foods I was eating could be behind my condition. If your eczema is associated with food allergies or sensitivities, you should try going on an elimination diet. The most common foods that can cause allergic reactions are dairy, eggs, peanuts, soy, corn, tomatoes, fish, citrus, and gluten. To follow an elimination diet, you must avoid all the possible trigger foods for a period of time, usually three to four weeks. Then, gradually re-introduce each food group one at a time, tracking any symptoms you may have. To soothe any patches that were uncontrollably itchy, I used a hand salve that contained calendula flower. This herb has been used for many generations as an anti-inflammatory to treat a range of different skin conditions. 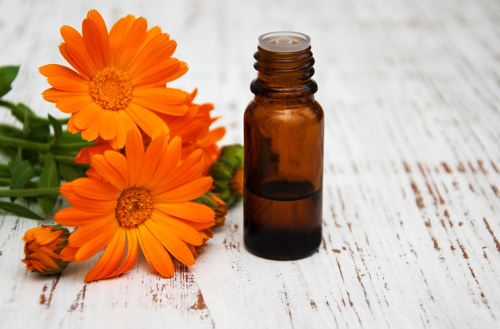 Calendula is believed to benefit the affected areas by reducing inflammation, eliminating bacteria, and helping the skin heal. To help manage environmental factors that can trigger eczema, I recommend practicing meditation to help with any stress. I also believe that switching to a natural laundry detergent and using natural lotions and cosmetics can help minimize any extra skin irritations. Avoiding extreme temperatures for long periods of time will also help. And if you do go out in the heat or cold, try to cover as much exposed skin as possible. If you or a loved one is suffering with eczema, I hope that sharing my story and how I manage my symptoms may be of some help. Although there is no cure for the skin disorder, there are measures you can take to greatly reduce the severity and amount of flare ups. I can happily say that by cutting out specific foods—and managing stress levels—I now live with very little symptoms at all. “What are the causes of eczema?” Mercola; http://articles.mercola.com/eczema/causes.aspx, last accessed May 30, 2017.